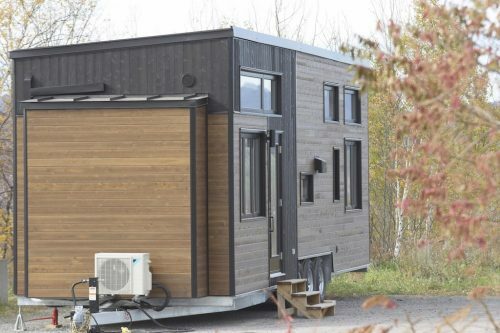 This is a 270sqft tiny house. 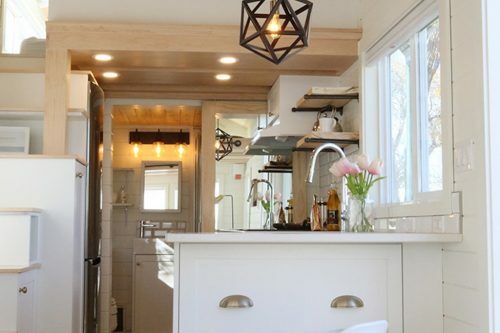 It is custom built with custom cabinets and butcher block countertops. 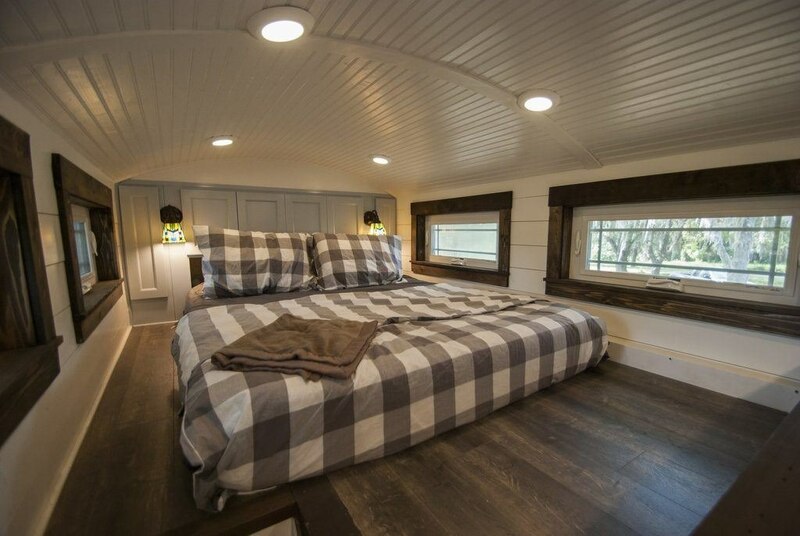 It has a barreled ceiling and a custom built reclaimed cedar soaking tub. This house also features a full Lutron home automation lighting system. And a wifi enabled 22.5 seer ac/heat pump mini split unit. 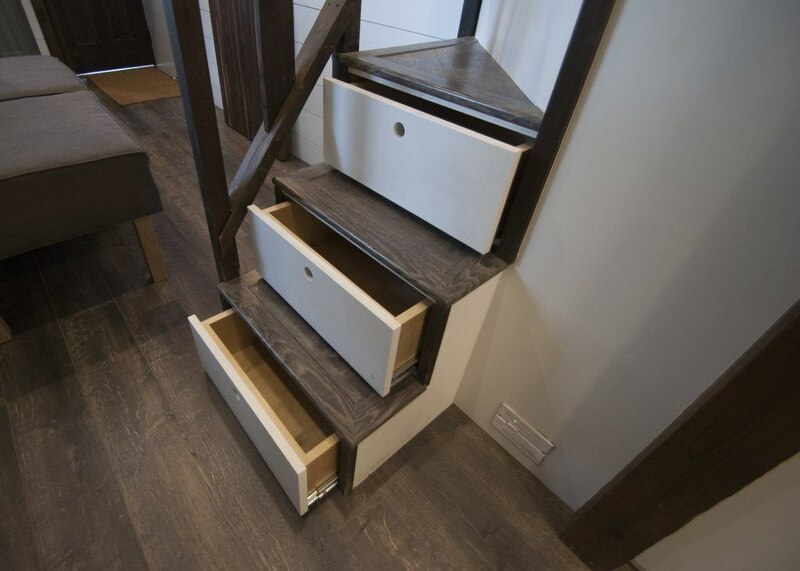 It has many storage options as you can see in the pictures. 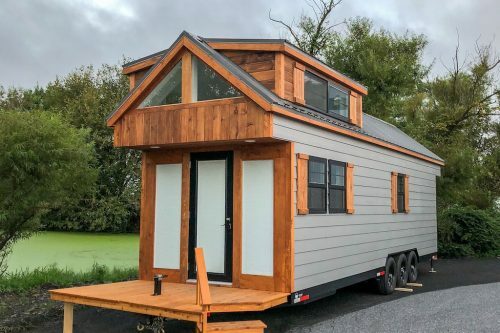 A 270 square feet tiny house with barrel roof and removable soaking tub in Davenport, Florida. 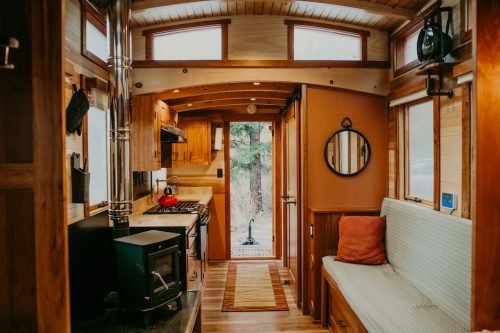 Built by A New Beginning Tiny Homes. More info. here. This is so pretty but I’m confused by the tub and shower – apparently the tub can be removed or inserted into the shower enclosure? How heavy is it and where is it stored if not in use? Just leave the tub in if you prefer to shower. Leave the tub drain open and the water goes right into the shower drain and out. 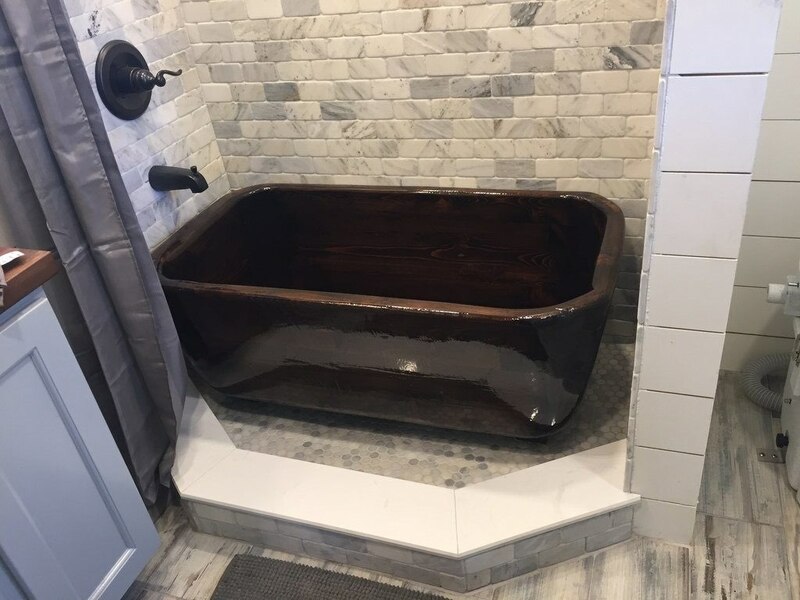 I don’t like bath tubs but it would be nice for washing the dog or bathing little kids and would contain all the splashes where the shower edge might not. This house has been posted before. I loved this one when it was first posted. Now, with the bathtub in the shower, not so much. I’m with Annette. Unless that thing is super light, it’s going to be very difficult to maneuver it around and outside of the house. There are things I love about this house, namely the finish, the fittings, the stained glass, having the kitchen and bathroom at either end of the house, the matching bathroom pocket door, the under stairs storage etc. On the other hand, while the bath itself looks great is also seems impractical (as has been said), it is too small to be comfortable and you are likely to use the shower most, so it will generally be in the way. I always like the look of having having the entry door at one end of the house, but for liveability, it would be better on one of the long sides with the kitchen across the whole of the end wall. It does not make sense to have large clothes storage in the bathroom where its steamy and damp. Better to make the shower slightly smaller (but still larger than most tiny houses), juggle the space to put the washer dryer in the bathroom with a sink over and the clothes wardrobe in the main living area. Also I would scrap the second loft as a larger area of higher roof line will make the whole house seem way bigger. If the sofa/ottomans are made slightly bigger they can converted into a guest bed instead. Love, love, love this home! Love the easily removable bathtub. I admire how much detail went into this home. Love the exterior. But I still am puzzled about people choosing dark wooden colors on the interior. 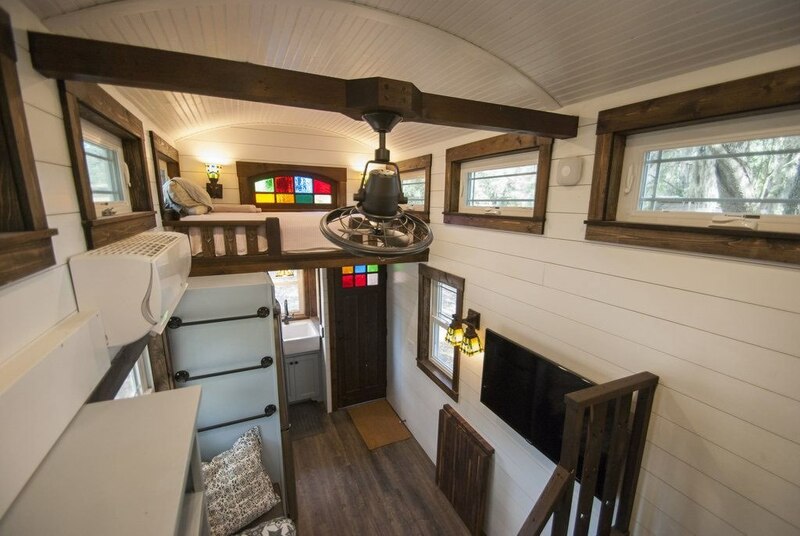 It makes the room look even smaller, than it is, and “eats” the natural light. But is it LEGAL? 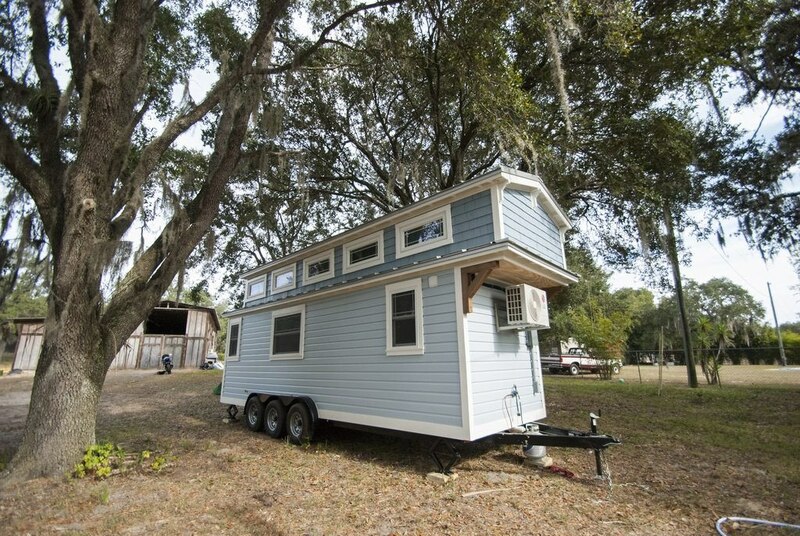 I am trying to get the City of North Port to allow us to live in our tiny house, and they say it is prevented by zoning laws-whether we call it an RV or not.